5 Star saddle pads made from 100% wool are a two piece construction to ensure the best contour to your horse’s back as quickly as possible. There is no breaking-in period, these saddle pads are comfortable and effective from day one. Eliminating spinal pressure on your horse or mule is the benefit of the two piece design. It provides a great fit for you saddle without compensating with over-cinching. Your horse or mule will love this unique feature and you’ll notice the attention to detail as each saddle pad is handmade to order. There are a lot of different riding disciplines out there and selecting the proper saddle pad for your type of riding is important for the best in fit and performance. Made right here in the USA, these and all 5 Star saddle pads are 100% wool. You may choose from as thin as 1/2″ to the very thick 1-1/8″ pad. Every pad is made in all four colors and offer a choice of embroidery and standard leathers in four different colors. Fitted for a mule, jack and donkey’s back line, these 100% wool saddle pads are made for flatter backs, withers and the thick shoulders of these animals. They also come in all four colors, offer embroidering and your choice of four different colors of standard leathers. If high performance is at a premium, a barrel racing saddle pad is a great fit. It will keep your horse comfortable while performing at maximum effort and won’t let your saddle slip around on you as you go. You may specify if you’d like the corner rounded on the front, back or both to fit your personal preference. Four different colors of standard leather, embroidery options and four colors of saddle pad are also available to you on all saddle pads. The English saddle pads provide the greatest comfort possible for both horse and rider when riding English. They’re available for hunter/jumpers, dressage and all purpose riding as well. At Barn World, we have a large selection of saddle pads, cinches and breast collars. Barn World is much more then livestock equipment! Please visit www.BarnWorld.com or call (720) 238-2190 to help with all of your tack and livestock supplies. Saddle Pads: Choosing an equestrian saddle pad for your type of riding. Barn World is proud to carry the 5 Star line of saddle pads for all of your riding needs. When choosing a saddle pad it’s important to choose the proper saddle pad to add to your equestrian tack room. Proper comfort and fit is essential to provide hours of pleasurable riding for both horse and rider. Generally, you want your saddle pad thickness to guide your purchasing decision. 1/2″ Under pad is great for pleasure horses, cutting and reining. Use these saddle pads when you want protection, but would like a colorful saddle blanket for show purposes. 3/4″ Regular Saddle Pads are a great equestrian pad for daily training and exercise and can accommodate a blanket as well. 7/8″ Thick Pad is the best for all-around use such as barrel racing and trail riding. 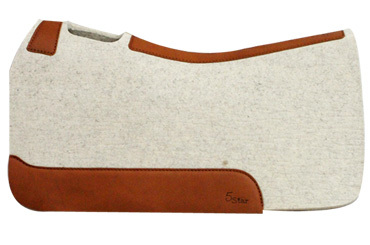 This is the most popular equine saddle pad sold. 1″ Extra Thick Saddle Pad is a real working pad for roping or longer distance riding with a lot of gear. 1-1/8″ Supreme Roper Pad is a very thick equestrian pad designed for team and calf roping performance. Visit Barn World today and pick out what may be your most import piece of equestrian tack for your saddle! Saddle Pads: The best saddle pad for any type of saddle and an equestrian must for both horse and rider! Barn World is proud to offer equine saddle pads, the top quality saddle pad and a must to properly fit your saddle to your horse. 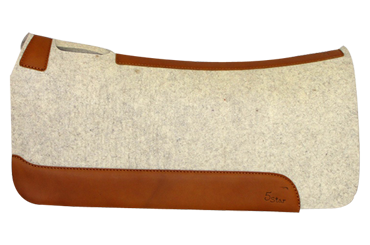 The 100% wool equestrian saddle pad offers the best fit and comfort possible for you and your horse. The saddle pads are designed to fit the shape of your horse’s back and is excellent at absorbing moisture and wicking it away from your horse. This pad is an essential piece of tack that belongs at the top of your equestrian horse tack list. Of all the saddlery tack available, it may be the most important to your horse for riding comfort. 5 Star saddle pads have a unique two-piece construction that eliminates spinal pressure and improves saddle fit, that means no over-cinching. they have a true French Curve back line and withers slope. The equine saddle pads are specifically designed to fit the shape of your horse’s back: Wither height and back line variance along with equine hip placement are given special attention to provide the best possible saddle pad fit that will conform to the shape of your horse. This will make both horse and rider very happy. The saddle pads are handmade in the United States and are all natural 100% wood felt. They are soft, durable and offer easy clean-up. For the best in saddle pad equine tack, visit Barn World at BarnWorld.com today! No other saddle pad or saddle blanket is necessary with the 5 Star Contoured Saddle Pad. Double padding creates movement and slippage of the saddle pad and saddle. This slippage is usually compensated for by overcinching. The contoured fit of our pads means a limited need for cinching with minimal saddle movement. Square cut pads do not follow a horse’s back contour. This can cause injury. 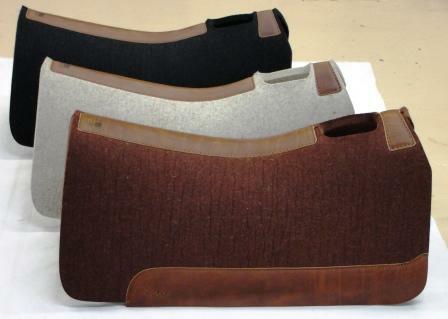 Visit BarnWorld.com for all of your saddle pad needs. Barn World carries everything from English saddle pad to extra thick contour saddle pads and everything in-between. Barn World carries 5 Star Equine Saddle Pads for all your riding needs. 5 Star saddle pads offer the best protection for you horse’s back and are made from 100% Wool. 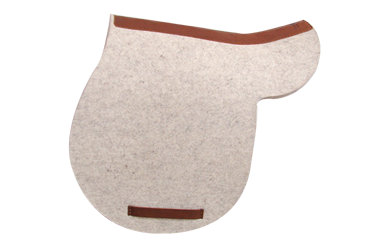 The World’s Finest, All-Natural 100% Wool Contoured Pad are specially designed to fit the shape of your horse or mule’s back. Unique, two-piece construction eliminates spinal pressure and improves saddle fit – no over-cinching. The 5 Star Contoured Saddle Pad is the original Western contour pad with “a true French Curve backline and withers slope.” Special attention is given to wither height, backline variance and hip placement which results in a GREAT FITTING PAD that conforms to the shape of your horse or mule. This conscious effort in design has produced a pad that fits most breeds of horses and mules without “break-in” fitting. 1/2″ Under Pad Great for showing, reining, cutting or pleasure horses when you still need protection yet want to put a colorful blanket over the under pad for show purposes. 3/4″ Regular Pad An excellent all-around pad for those that need a daily exercise training pad and may also need to throw a blanket over for the show ring. 7/8″ Thick Pad The best all-around use pad recommended for trail riding, team penning, cutting, reining, and barrel racing. We can also cut the 3/4″ and 7/8″ pad in a 28″ length for barrel racing saddles. 1″ Extra Thick Pad Designed wih ranch work in mind, for roping, performance, colt starting or heading to the mountains with lots of gear. 1-1/8″ Supreme Roper Pad Specially engineered for team roping, calf roping, steer stopping and peformance. Simply spray pad with water, rub soiled areas in a circular motion with fingers or a rubber curry comb and hang to dry. A gentle detergent may also be necessary. Do not lay flat on it’s back (upside down). With this reasonable care, pad will last 1500-2000 hours. 5 Star 100% Wool Felt Contoured Saddle Pads contain 90% virgin wool and 10% reworked wool giving your animal protection that will last 2,000+ hours with reasonable care. 5 Star’s felt has been made with heat, steam and pressure which eliminates any concerns about shrinkage or distortion as you begin to consider cleaning needs. Prevent dirt and hair build-up on the under side of pad by brushing occasionally. This keeps old hair from trapping dirt & sweat, and embedding deep into the pad. To remove embedded hair and dirt, rotate a dry 5 Star Cleaning Sponge in circular motion on dry pad. Wipe hair off sponge surface with your hand while cleaning pad. For pads with heavy crusted sweat and dirt, break up areas with rubber fingered curry or scrape gently with a dull edged object being careful not to cut the felt. Use a vacuum to remove excess grime and loose material. A brush or a swift slap with your hand may also be used to sweep away dirt and hair. Every 5 Star pad comes with a label that describes the basic method for cleaning and an all-natural dry-cleaning sponge! Visit BarnWorld.com today for all your equine, livestock equipment and farm and ranch equipment needs. Barn World carries 5 Star Equine Saddle Pads for all your riding needs. 5 Star saddle pads offer the best protection for you horse’s back and are made from 100% Wool. The World’s Finest, All-Natural 100% Wool Contoured Pad are specially designed to fit the shape of your horse or mule’s back. Unique, two-piece construction eliminates spinal pressure and improves saddle fit – no over-cinching. The 5 Star Contoured Saddle Pad is the original Western contour pad with “a true French Curve backline and withers slope.” Special attention is given to wither height, backline variance and hip placement which results in a GREAT FITTING PAD that conforms to the shape of your horse or mule. This conscious effort in design has produced a pad that fits most breeds of horses and mules without “break-in” fitting. The 1″ Extra Thick Saddle Pad is designed with ranch work in mind, roping, performance, colt starting or heading to the mountains with lots of gear. The 7/8″ Thick Saddle Pad is the best all-around use pad recommended for trail riding, team penning, cutting, reining, and barrel racing. The 3/4″ and 7/8″ pads are available in 28″ lengths for barrel racing saddles. The 3/4″ Regular Saddle Pad is an excellent all-around pad for those that need a daily exercise training pad and may also need to throw a blanket over it for the show ring. The English Saddle Pad is designed and shaped to conform to the back and English-type saddles for Show, Dressage, Hunter/Jumper, Walking Horse, and Jockey. Every 5 Star pad comes with a label that describes the basic method for cleaning and an all-natural dry-cleaning sponge! Call Barn World at (720) 238-2190 or visit BarnWorld.com to browse our large selection of saddle pads and livestock equipment.